Whether you're putting holes in paper targets or pesky varmints, this .22 Long Rifle ammo from Sellier & Bellot can deliver at a reasonable price. Each cartridge in this 500 round "brick" fires a 38 grain hollow point bullet at a muzzle velocity of 1,230 feet per second. This is considered "high velocity" ammunition. Sellier & Bellot ammo is made in the Czech Republic. 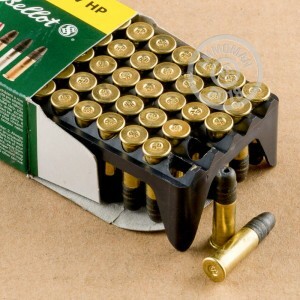 Grab this ammunition or any other items totaling $99 or more to get free shipping from AmmoMan.com! Good ammo through bolt action. Ammoman service is unbelievable! Ordered Wednesday afternoon, shooting on Friday ! 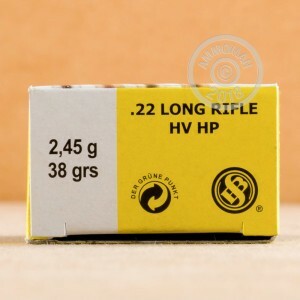 Ordered this ammo for my wife's Walther P22. Put about 100 rounds so far without a single miss fire. Very nice 22lr. Great round for the money now days. I ordered on Wednesday and it arrived on Saturday. Got my new little Ruger 22 lr and had a blast plinking away on Sunday. No problems easy to load and shoot. Way to go Ammo Man! Bought a brick and have fired about 150 rds out of a M&P15-22 with no problems what-so-ever. Very nice, not too terribly dirty for a .22 rd. Feeds and ejects cleanly and consistently. Worth it, give it a try! !